Learn to identify the various types of resistors available and their benefits or disadvantages as components. Resistors are the bread and butter to just about every electronic circuit, it's almost impossible to find one without it. So, what do these components look like? How can they be identified on circuit boards? Like most components, resistors come in all shapes and sizes. Large resistors are often needed for high power situations, miniature resistors are found in very small devices. The standard through-hole resistor is found in older circuits as well as hobby circuits. Almost all resistors have the symbol “R” on a PCB and most can be salvaged for future projects. Carbon film resistors are the most basic type of resistor available and have been used in the electronics industry for the last 40 years. 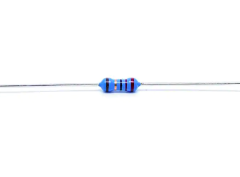 These resistors have color bands which indicate their resistance and tolerance levels. While a carbon film resistor’s tolerance level can be as high as 10%, the majority are around 5% and typically have a power rating between 0.125W to 5W. Note: The most common resistor is the 1/4W—which can almost always be identified by its yellowish-colored body. Carbon film resistors on a ZX spectrum PCB . Metal film resistors are very similar to carbon film resistors—except for their greater tolerances and temperature coefficient properties. They are often found in situations that an accurate resistor is needed (such as multi-meters) with tolerance levels typically between 0.1-2%. Just like carbon film resistors, metal film resistors use color bands to indicate their resistance. An example of a metal film resistor. Image courtesy of Mouser. Thin film resistors are commonly found in modern electronics, as they are frequently used in surface mount resistors. These resistors have a typical tolerance level between 1-5%, which makes them useful for general use (analog circuitry, pull-up resistors etc). Thin film resistors come in a range of sizes—0603 being the most common (1.55mm x 0.85mm). SMD resistors are incredibly small and are difficult to salvage and it's arguably cheaper to purchase new parts. Depending on the resistor, there may be a number printed on it. This number is often a resistor code which represents its resistance. A zero-ohm jumper resistor on a PCB. Power resistors are very large and often have a low resistance level (0 to 100 ohms). They are designed to be used in projects requiring a large voltage or current (such as motors and other high powered equipment). They come in different styles with the smaller varieties being made of a white ceramic block, whereas larger resistors are housed in aluminum housings. A ceramic and power resistor. Images courtesy of Mouser. Carbon composition resistors are one of the first resistors to be mass produced. Like carbon film resistors, they have color bands that indicate their resistance value and are housed in plastic cylinders (often brown). These resistors are almost never used for manufacturing purposes as they have poor tolerances and are expensive. However, they are beneficial as power suppliers, as they have low inductance (being a solid material as opposed to a conductive loop). An installed and uninstalled carbon composition resistor. Image courtesy of Mouser. Sometimes, many of the same resistors are needed in parallel, such as pull-down resistors on a data bus or series protection resistors for input connectors. In these situations, resistor arrays come in both through-hole and SMD format. Through-hole arrays are either in SIP (single-in-line) or DIP (dual in-line) packaged and are either black or beige in color. SMD resistor arrays look similar to SMD resistors connected together in a SOIC-like package. An SMD resistor, DIP resistor and SIP resistor. Images courtesy of Mouser. 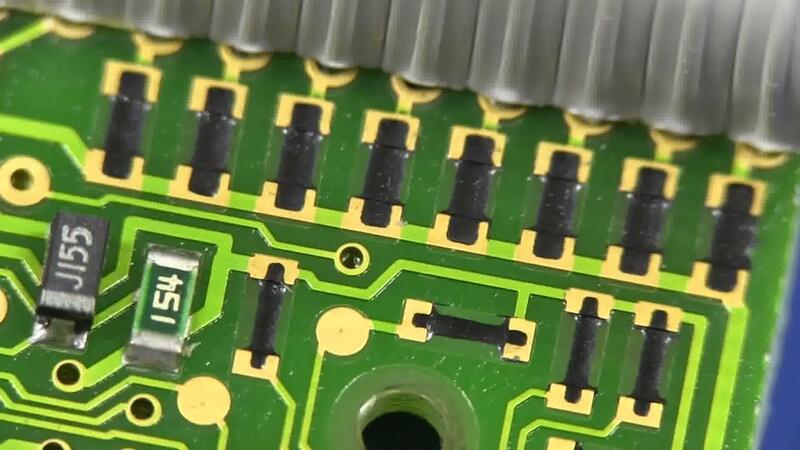 In some instances, the accuracy of a resistor is not entirely important (such as with pull up/down resistors) and using a standard carbon film or SMD resistor may be too costly in a mass-produced environment. In this case, carbon resistors can be printed directly onto a PCB. These resistors are nothing more than a carbon compound painted between two contact points. The tolerance of these resistors can be as high as 30% and it's almost impossible to scrap them. Shunts are specialized resistors that are used in ammeter applications. They often consist of a piece of metal between two connectors and have very low resistance (less than 100m Ω). Shunts are known to be very accurate and capable of handling large currents (10A for example, is not uncommon). These resistors, however, aren’t worth salvaging, as they have a very specific application and are rarely found in circuits. 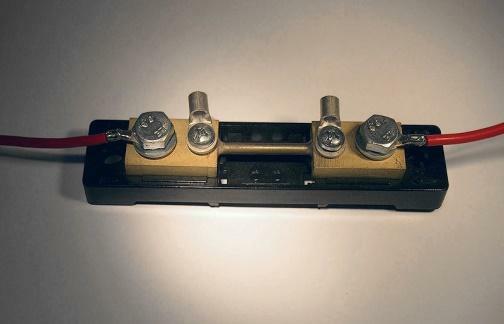 An example of a 50A shunt. 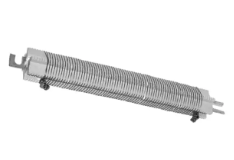 Wirewound resistors are made from wire wound around an insulating core, often made of materials such as nichrome. They aren’t usually found in domestic circuits and aren't ideal for many circuits as they have a high inductance level (due to the coil design). They are popularly used in circuit breakers or as fuses. An example of a wirewound resistor. Image courtesy of Mouser.